Black truffle oil pasta combines the delicate earthiness of black winter truffles with pasta, taking an every-night dish to a new level of flavor. Because you use truffle oil instead of truffles, you can get the flavor of truffles at a fraction of the price. Black truffle oil is olive oil infused with the flavor of black truffles. Truffles are a very expensive delicacy. Black truffles grow underground in France, and can fetch more than $400 per pound. Black truffles are also called winter truffles because truffle purveyors harvest them between September and December. There are two types of black truffle oil. One is infused with actual black truffles although the delicate flavor is difficult to capture in an oil base. Truffle infused oils that provide a good hit of truffle flavor are usually quite expensive, although not nearly as expensive as the truffles themselves. The other type of black truffle oil is made with flavoring agents that mimic the taste of black truffle oils. These oils retain the truffle flavor better, require less oil to obtain the flavor and are generally less expensive than truffle-infused oil. Numerous varieties of pasta exist. You can buy dried pasta and fresh pasta in a variety of shapes and sizes. You can also make your own pasta. 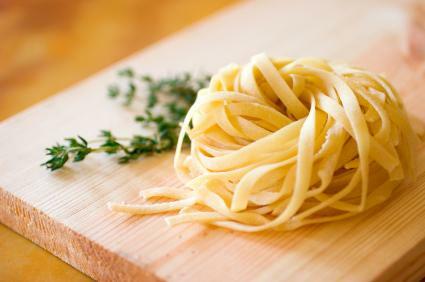 Fresh pasta tends to have a more velvety texture than dried pasta, so fresh pasta stands up well to delicate flavors. If you have a pasta roller, you can make your own with some flour, olive oil, eggs and water. Otherwise, you can purchase pre-made fresh pasta in the refrigerated section of your grocery store. Fettuccine works well with black truffle oil. Cook fresh pasta al dente and drain it without rinsing. Drizzle the pasta with a little bit of black truffle oil. Finish the dish with a sprinkling of shaved Parmigiano Reggiano cheese. The delicate flavors in black truffle oil don't hold up well to heat, so it's best to drizzle the oil on after cooking rather than cooking with black truffle oil. It is very flavorful, so a little bit goes a long way. If you're looking for something a little less simple, there are many ways that you can vary your recipe. The sweetness of shellfish pairs well with truffels, as do earthy mushrooms. Oven broil shrimp and toss with the pasta and truffle oil. Drizzle truffle oil over Fettucine Alfredo. Pan sear sea scallops to toss with the pasta and oil. Sauté mushrooms, which pair well with truffle oil, and toss them with the pasta and oil. Brown butter in a sauté pan and toss in some chopped fresh thyme. Toss with the pasta and truffle oil, and top with shaved Asiago cheese. For a really luxurious meal, pair truffle oil pasta with lobster or crab. Steam asparagus to add to your pasta. Render pancetta and toss it with pasta. Shellfish such as clams and mussels will work well with this dish. Try other cheeses such as Romano, Asiago, Mizithra or other Italian hard cheeses. Try different pastas such as tagliatelle, farfalle and other broad, flat noodled pastas. Serve pasta and truffle oil as a side dish with a good cut of meat, such as filet mignon or prime rib. Many foods and wines go well with pasta and black truffle oil. While pasta and black truffle oil is simple to make, you can turn any meal into a special one. Try one of the additional foods mentioned above, or add one of your own favorite foods to the dish and enjoy a very satisfying meal.